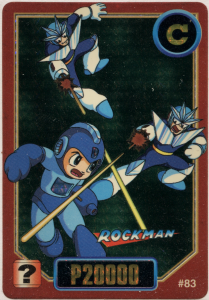 Back around 1996 when China ran out of Japanese Rockman Carddas cards to import, they decided to make some of their own. 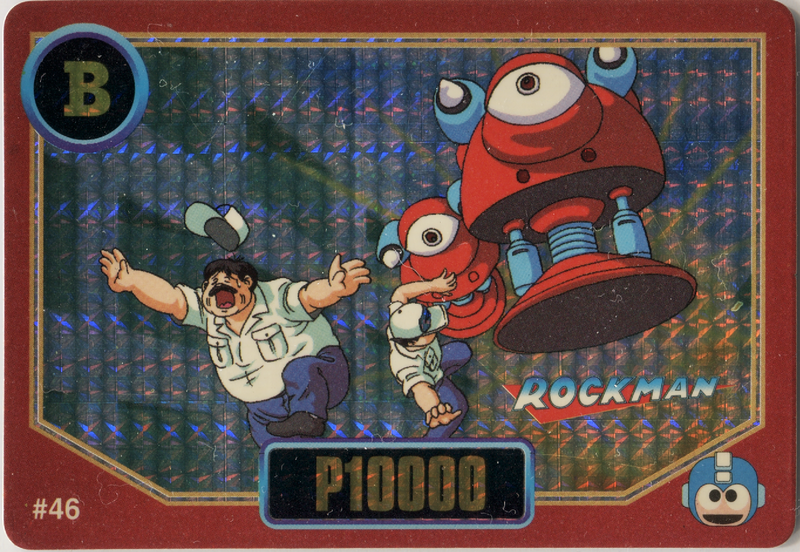 Collectible card kingpin Adali took images from Shigeto Ikehara’s popular Rockman mangas (most of which had been released in China already), colored them, slapped some holographic foil on there and ba-da-boom, you’ve got a new cash crop. 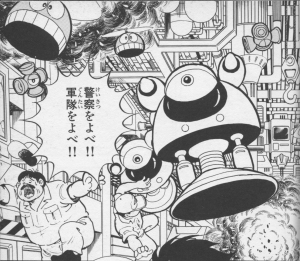 Now fans could revisit their favorite manga scenes in bright surrealistic color. 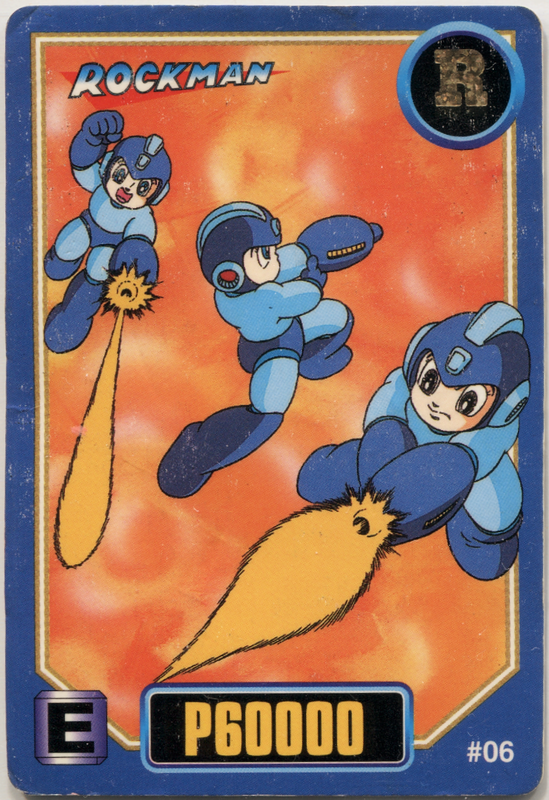 Standard card back for the Chinese card series. 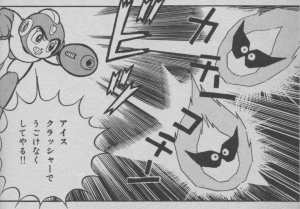 For comparison, let’s look at the card first and the original scene from the manga second. We’ll be going in the numbered order given on the 8 cards. I have no idea what the “P10000”, etc. values or the “R, G, B, C…” letters are for. 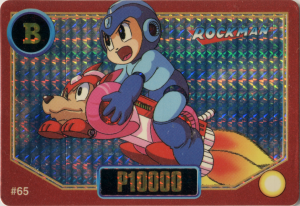 #06 Rockman buster action poses over a fiery backdrop. E-can in the bottom left corner. Rockman splash page 22 & 23, here we can see what Rockman was shooting at. Rockman destroys a purple Big Eye (you won’t find one that color in the games). 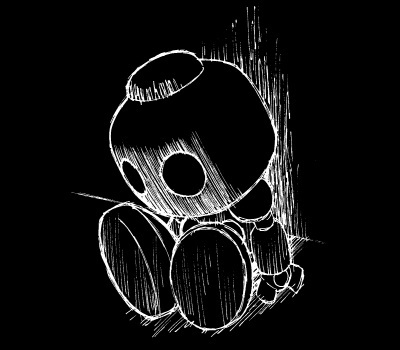 1-UP in the corner. 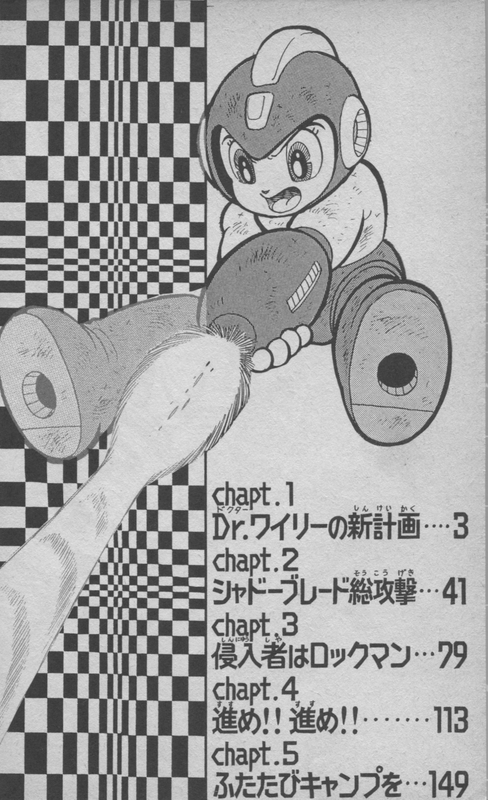 #24. Death of Ice Man. 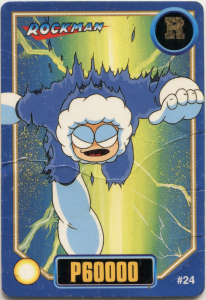 My card is bent and damaged, as you can see. Life energy in the corner. 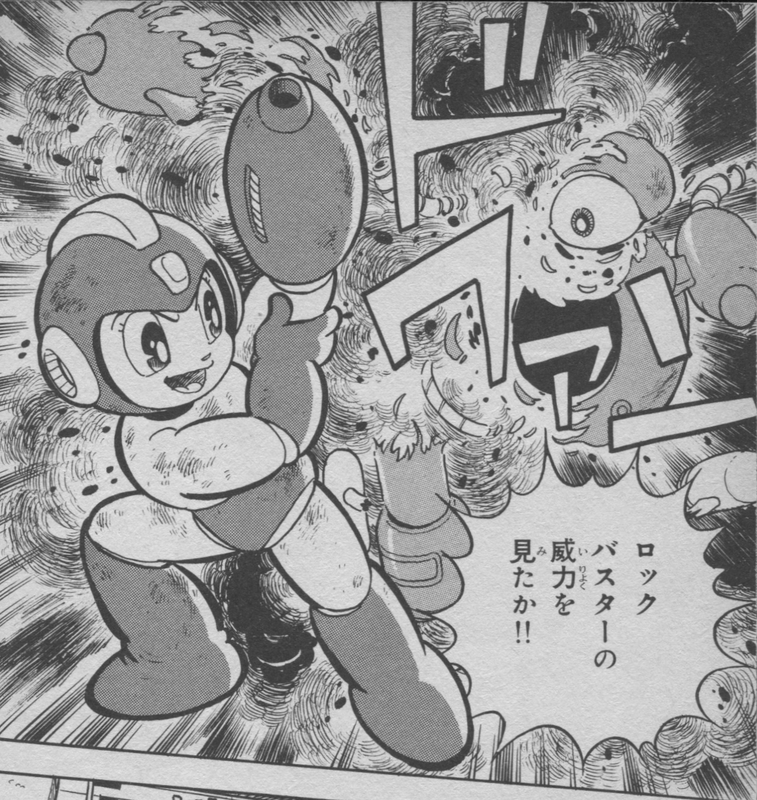 Rockman p83. Ice Man is zapped by the “R.S. 1,000,000 Volt” thunder beam. #26. 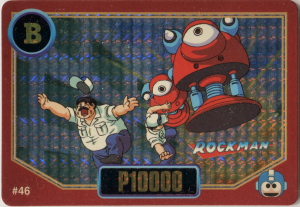 Rockman battles 2 Fry Guys Changkeys. Life energy in the corner. 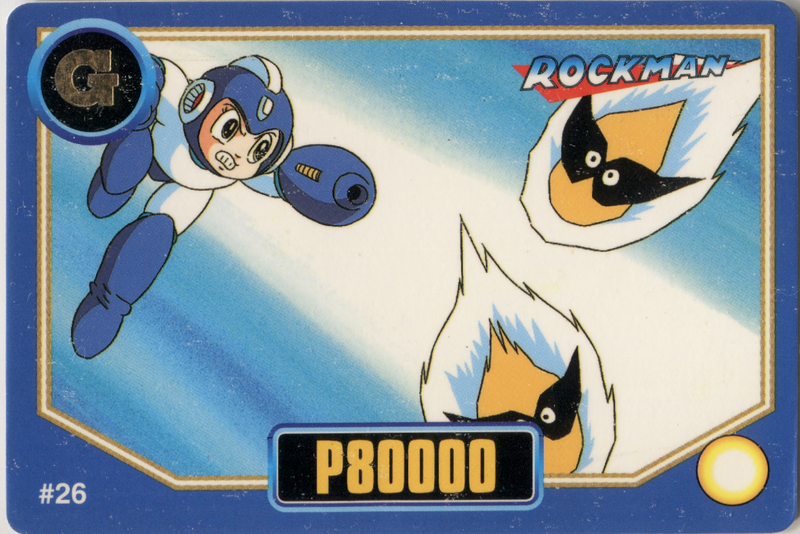 Rockman p90. 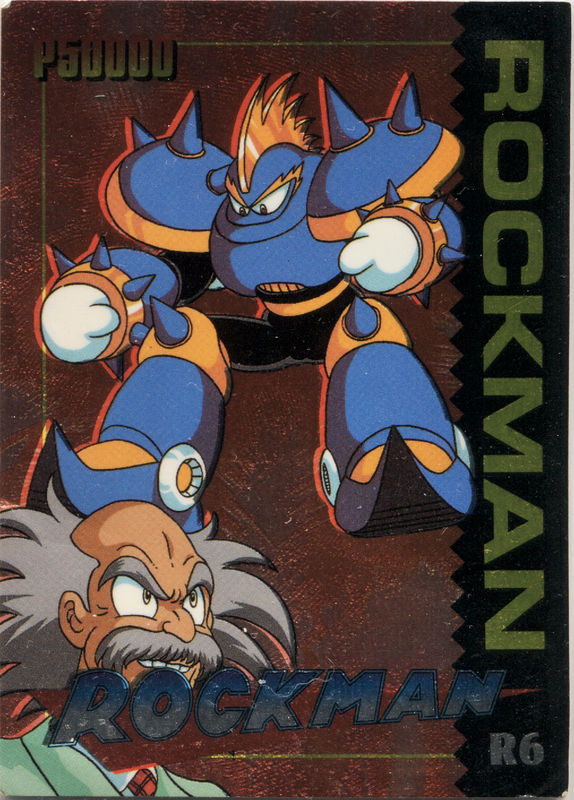 ”The Ice Crusher will stop you in your tracks!” (Should be “Ice Slasher”, but the card impressively got Rockman’s armor color for that weapon right. Too bad they edited the shots out). 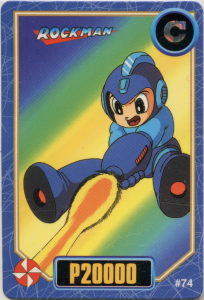 #46, holographic card. 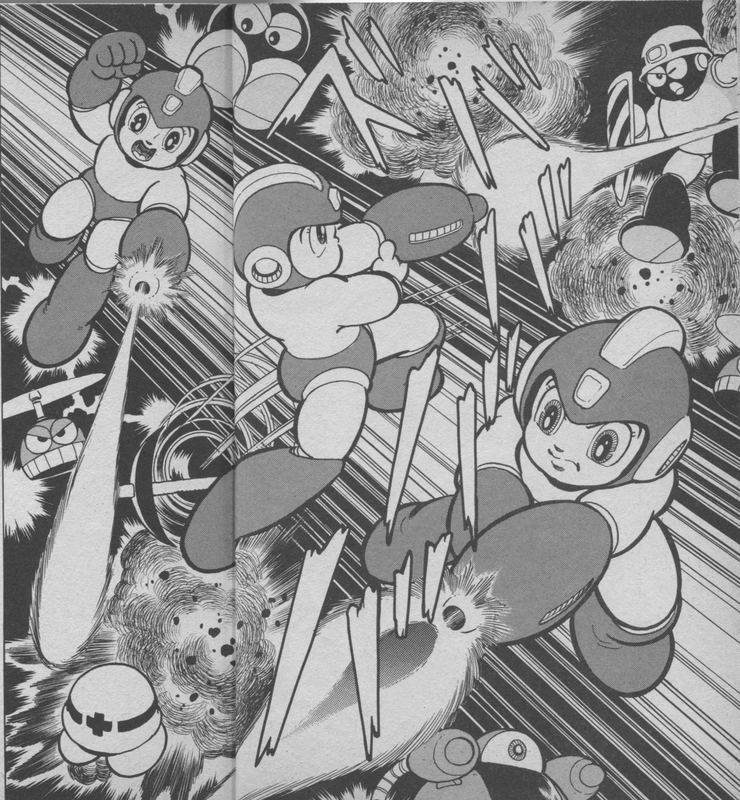 Human workers run for their lives. 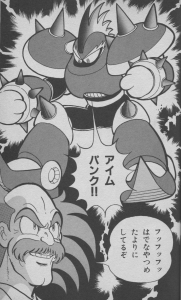 Odd shading on the Big Eyes that almost looks like cloth. 1-UP in the corner. 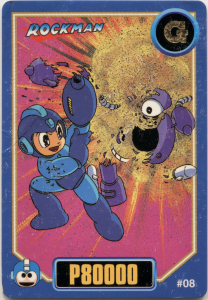 #65 holographic card. 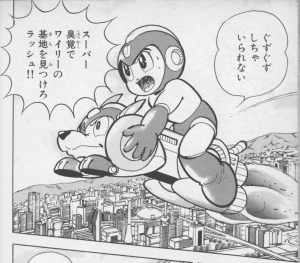 Rockman and Rush Jet to the rescue! Life energy in corner. #74. 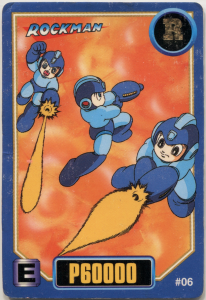 Jump and shoot! 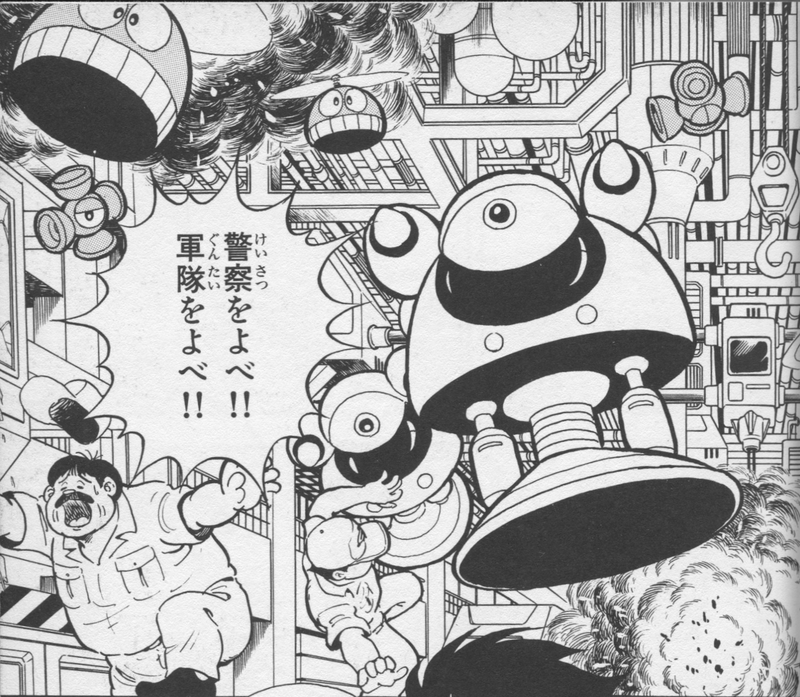 Yashichi in corner. 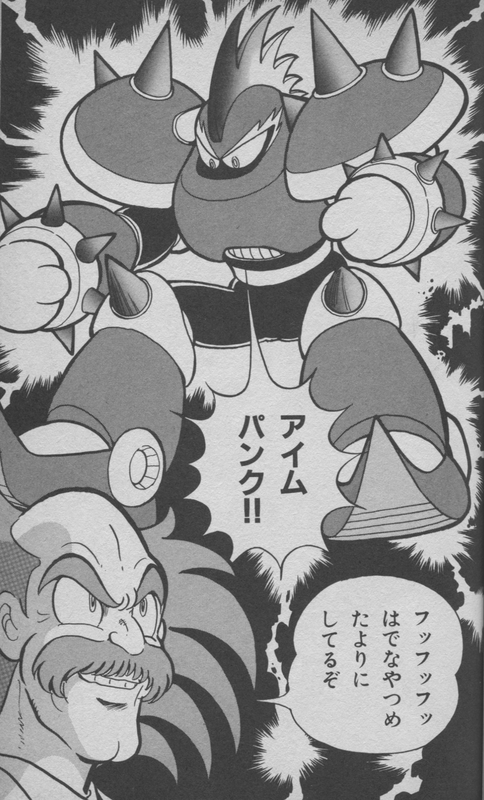 Rockman World 3 p2. 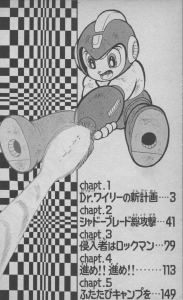 Table of contents image. #83, holographic. They made Rock’s helmet and chest parts holographic too for some reason. 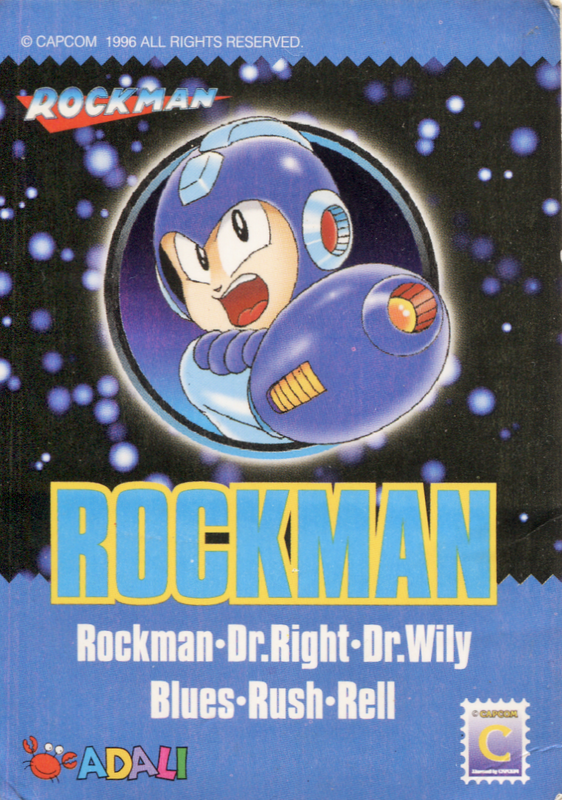 A Rockman 3 ?-can in corner. 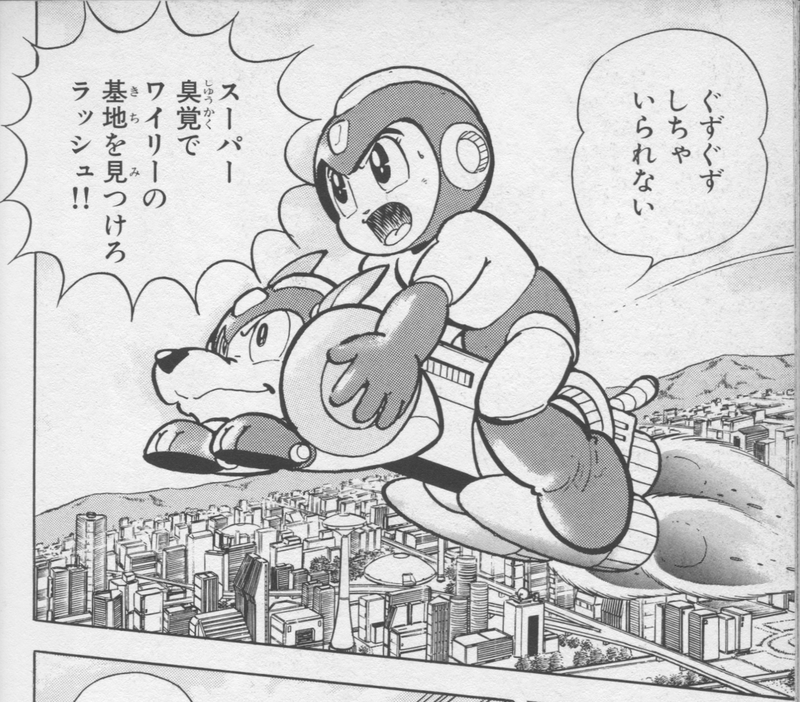 Rockman World 3 p39. 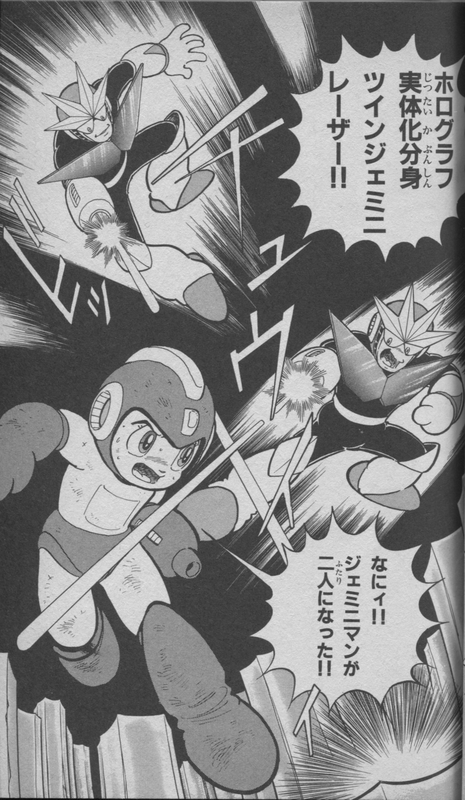 Gemini Man uses his holographic generator to split into two. #R6 special holographic card. Here’s that blue Punk again. 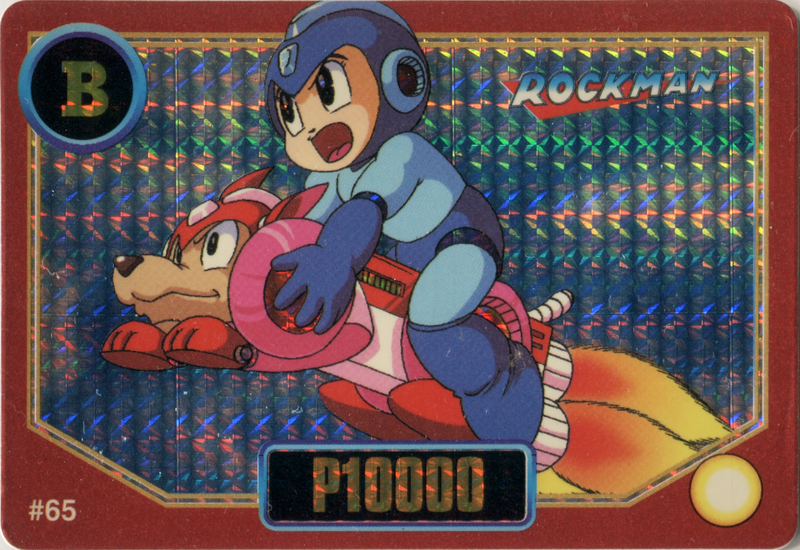 That’s all I have from the classic Rockman set, but there’s more to come with the Irregular Hunter Rockman X set. I’d love to get my hands on more of these, but they seem pretty rare to come by these days. Hope you enjoyed. 2 Comments to "Comic to Card: Ikehara x Adali"
¿Rell? Also R, G, B, C….. Red, Green, Blue and -Chinese- Cyan?